I decided to put together a picture video review. I am really glad I did too. I was having fun putting it together and it was not till I watch the video myself that I got really excited. I have been down on myself for not achieving the one goal I set out to achieve. I have been really beat down about so many things this past year. All of that negative has clouded up my head and this video was a nice reminder of all the things I have done and accomplished. I hope you enjoy watching it. Some of the pictures may need explanation but every one of them does mean something important to me! HAVE FUN! HAPPY NEW YEAR! I have given up many things to be where I am today in the light of my future goals. I will not be the first to tell you that change is not easy but I can tell you that determination will get you where you are meant to be. Everything happens for a reason, everyone we meet and everything that happens to us has a great reason that is up to us to discover. I can do anything I put my mind to and if it is too easy I don’t just settle. If it feels natural, then down the line it is certain to be littered with challenges. Seeking out and agreeing to shut off my whole land life to work on a cruise ship was not easy. I was a nervous wreck. I stepped foot on that cruise ship for the first time as a worker and I knew I belonged there. Working on the cruise ship is where I vented out every negative thought I had: It was several emails that would scare the crap out of you, addressed to some of the most amazing people on this planet! This is also where I fell in love with the ocean! I returned home and for me it was not a happy homecoming. I pulled the plug here, things with me were dying inside, friendships were disappearing, and sadly I was losing connection with my family. I was always the weird one in my family and just when they got me all figured out it was like an explosion of change. I felt like they did not understand what was going on, and sometimes neither did I. Do not misunderstand, I love my family and I know they care about me but I don’t think they understand the magnitude of this change that has sparked a fire in me. Riddled with a life of negatives I wanted out. I am constantly working on a full life of positivism and in order to do that I had to leave. I was granted that window to leave and I moved to Florida! The Ocean was calling my name. I went from leaving everything temporarily to leaving it for good. Yes for good. I left my family, my friends, my Scout group, my bike rides, my soccer team, my pizza, and about 75% of everything I owned. You know what change looks like? A packed Chevy Cobalt with a bike on the back and a kayak on top, driving 1200 miles straight through with a known history of falling asleep behind the wheel. I pulled away from my sister’s house, set my GPS, then my music and just cried. So starts my lonely journey south…. where I am meant to be. I started back socially where I was many years ago; with one friend. It has been easy to make work friends but I am a single guy in a world of couples and married woman. I am certain after 3 years here I am meant to be single and part introvert actually. Sure I get lonely sitting at home on Saturday night getting fat on mediocre pizza and writing blogs, but I am meant for greater things and I have to keep reminding myself that. I need to stay focused on my goals. Goals are what brought me down here, goals run my life. My social life has taken a huge hit but it is an underlining reality that I need the time to make myself bigger each day. It’s an open door to better consider what is best for my future as a motivational speaker. By any means is this lonely lifestyle boring? Anything but that really. The physical journeys have been plentiful with all my travels the last few years but I believe the time has come to focus my mind on my future career. I will never stop inspiring those willing to listen, and I will always be learning from any of your feedback as well. Life is amazing and more amazing as you find your passion and make your dreams come true. When I was in 5th grade I can remember being out at recess and fighting with my friend to not have to stand behind this girl in the line to go back inside. We did not want to stand by her just because we thought she was ugly. What senselessness we thought it was now that we are grown up, but at that age I did not know what empathy was. We could have very well destroyed that girl’s life. She still comes up in conversation in the recent years and we always say that she is probably a super model and we were just naive kids afraid of cooties. That’s not when I learned my lesson though. In Junior High I was hit hard with what some call Karma. I was hanging out at recess once again but this time it was with the group of bullies that picked on the same kids every day. One day it got physical, I pushed a boy to the ground and actually hurt him. It was that moment that I immediately hated myself and helped him right back up. I did not courage up an apology right away but I sorrowed tons of regret before I turned things around and became friends with this same person. After this terrible act of bullying the stars were not aligned for me. It was like being lost on a cloudy moonless night with no way to guide me home. This was the year of my first heavy crush and also the year of my fall into a bad depression. I lost every friend I had, except for one, including my crush. High School was terrible. Most people want to go back….not me. I learned of a learning disability I had with very low reading levels. I used up most of my lunch hours in a reading class, and the lunches I did attend I was forced to sit with kids of a lower grade because I was now the dork. You are probably wondering where the karma comes in? In High School I was the one being bullied. I was made fun of all the time, I was pushed around, I was excluded from things and picked last for activities. Oh Marc you need braces, as if it could get any worse. This did however start to turn around for me. I grow up with a strong family and a small hand full of great friends that I had at this point. I started to stand up for myself against bullies and I was winning. I started to show respect for those that are typically excluded and ignored. In college I began to come alive! I learned how to manage my depression without medication and my shyness lifted. I started dating and gaining friends galore. I became friends with anyone and everyone. I was proud that all my friends were friends with each other too. Everyone I brought into my circle they became friends with everyone else. The cool thing that holds true still today is my friends are friends with my siblings and we are all friends with their friends as well. There were no exclusions, we hung out and we partied with whoever wanted to join. You see I have turned myself around quite a bit, but I am not done. Bullying has gotten worse as the years go by and the internet has gotten more and more accessible to our younger generation to give ease to those with bad intentions. I have a soft spot for those that are picked on for any reason. Working in an elementary school has really shined light on my purpose of inspiring children to be more positive with their lives. I work with special needs children and I have the opportunity to talk to the other students telling them that we are all different and that’s okay but so much of us is exactly the same. I have had the opportunity to make some of these students realize what they are doing or saying to others is wrong. The great part is…it’s working! I can see it working. Has life shown me both sides of bullying to better help and empathize for those involved? Is my life culminating to a point where I can educate students to a more positive life for themselves and their peers? This same positive lifestyle education holds true to all those who will listen of any age. I want to stand up between the two side where bullying starts and tell our younger generation that there are grand reasons to stop bullying and there is a personality inside all of us with the strength to stand up, ignore, change and fight bullying. Many people have asked what my purpose is. Well if you have read this far now you know. When you see me with a positive attitude that’s real emotions. When you see me not smiling I am stepping through the next struggle in my life and climbing closer to my goals and purpose for smiling again. I will never bully again and I will always help others at all times. You can change your own life with a simple smile you can change everyone else with a simple smiling hello as you pass through each others lives for any length of time. Bullying has to stop and a more positive mind set has to begin. I have spent over a year putting memes together each week. They are all original quotes by me. All the photos are pictures I have taken unless I sited otherwise. It took a lot of time to put this together but I am excited that I have them all in one spot. I would be grateful if you had a spare 8 minutes to check them all out. Please feel free to let me know which one is your favorite. Have an amazing day and as always I am so grateful for all of your support and following. The summer is over. Alaska is in my past and my leg is almost 100%. I have an updated board of goals full of great ideas but I struggle to find the motivation to carry them out. I am at a motivational roadblock. I do not want to force my way through goals if the passion is not there and I do not want to go down the wrong path. You know the term practice what you preach, right? That is exactly what I need to do. I tell people all the time to take the situations and events in their lives one at a time to lower the stress level and be more successful in the end. I have slowed down my efforts but I have a list of achievable goals that make my life look amazing. 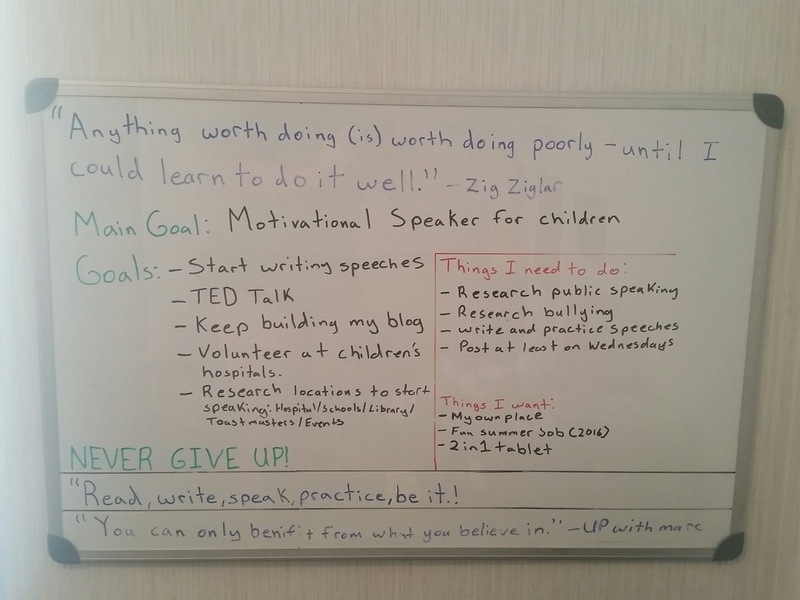 Teaching myself public speaking, research bullying, start writing and practicing speeches, build a successful TED Talks speech, and volunteer at children’s hospitals. These are only some of the big goals I have laid out for myself and I still have a job to keep up too. Para professionalism is still new to me. I learned so much last school year but this year there is even more. With my academic level of students with autism, outside of teaching them basic skills, we still have to handle behavior issues, bathroom issues, and now this school year I get to go swimming with one of my students too! With everything going on in life right now, I struggle to find my forward directional motivation. I love my job so much, but everything outside of it I cannot seem to give 100%. I have given myself an ambitious list of expectations and I need to take them one at a time. I want to jump right in and give 100% to motivating children, but there are so many things that need to happen first. I have started my search for volunteering at children’s hospitals; I believe this a valuable adventure for the children and me. Also found a course book for public speaking and I will start a routine of working through it every Sunday! Overall, I have great list of goals and challenges that lay ahead but I need to practice what I tell my followers and take them one thing at a time. This speaks for my career; there are still more adventurous ideas that lie within my reach. I would have never thought being full of great ideas, being open to new things, being part of great adventures and having such a positive outlook towards it all would actually have so many challenges at the front lines. However to alleviate all the lack of motivation and challenges all I have to do is accomplish my goals one at a time. From experience, this works every time. This is why it is so valuable to write things down so you can organize what is more important or what needs to come first. There is no problem having a goal list that is very ambitious, especially when you give yourself the right opportunities to make it happen. I have had this plaque sense I was a teenager. I bought it in New Mexico on a backpacking trip. Back in those times I was not always very positive but I did pride myself on never giving up on things no matter how hard they get. This is a big reminder for me when things get hard. One time things in my life got so incredibly hard I took a hammer to this thing. I wanted to break it but you can see how strong it is. You can see were the hammer hits it but never broke. I would say that day life was on my side. Without this sign I would probably not be here today. 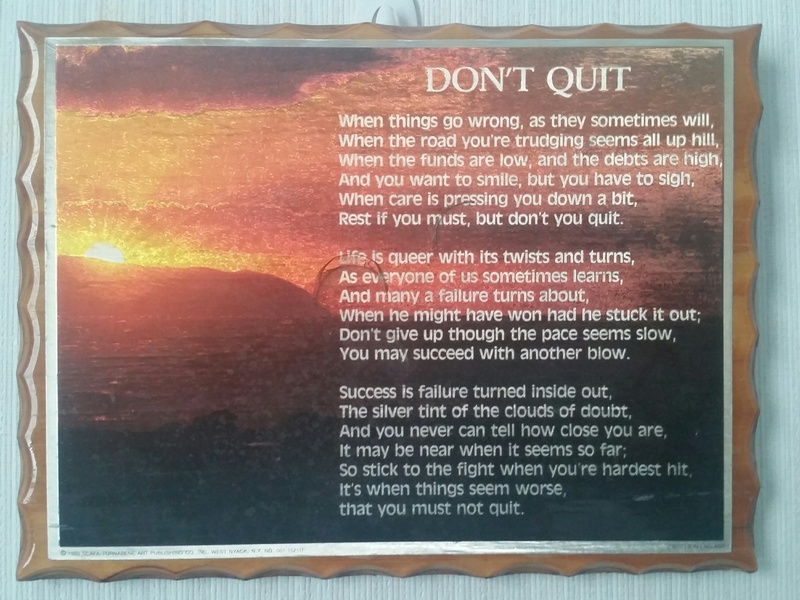 DON’T EVER QUIT! 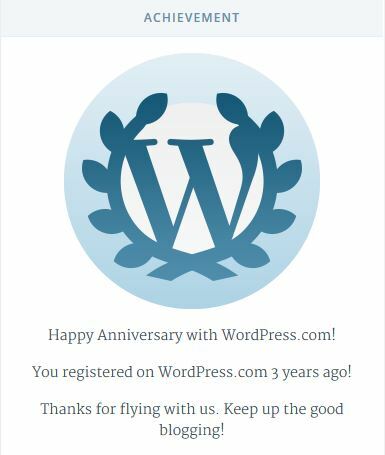 3 years of blogging and so many goals achieved. So many new goals and new experiences. The best part is there are more goals to come, more adventures to live, and more great people to meet! So excited to have kept up with this blog for so long. I was never a big writer before but practice makes perfect! I do not strive to be the greatest writer ever and my grammar and quick writing can show for that, but I do strive to make a positive difference in our world! My writing and Ideas can show for that! I LOVE ALL OF YOU WHO SUPPORT ME. I SEE GREAT THINGS IN OUR FUTURES! Sometimes you need to get answers that you cannot figure out. Sometimes you just want to know what to do next in your life. Sometimes you just have a simple question. When you have questions obviously you want them answered. Perhaps it is an answer that mom and dad can’t give you even though they know everything! Maybe it is beyond the realm of your teacher. Unless you’re fixed on the Magic 8 Ball for answering your life questions, there are still so many ways to get your answer. You can ask God, you can look to your guardian angel, you can entrust spiritual leaders or healers, you can scream life’s burning questions at the top of the mountain and listen to the answers in your echos. There are many ways to get life’s questions answered and I for one have begun asking the ocean! (warning long story :P) You can get your answer anywhere but until you believe that things happen for a reason you will never hear the right answers. Life is a personal journey and this is part of mine. I went on vacation with my sister. We went on a cruise through the Southern Caribbean. All I could think about before the trip was our day at sea. I had no Idea why the open ocean was calling to me. But I answered! The day had finally come and this day turned out to be one of the best days in my entire life. It was my first vacation with just my sister, it was my first time on a cruise ship, and my first time at sea. I sat out on our balcony for a good hour staring out to the endless nothings of the deep ocean. This was about 2 years ago and to this day I have shared this story with no one in such detail, not even my sister who was right there. The Ocean talked to me that day. It said “Marc this is where you belong, this is your life, this is your happiness, and this is where you start living your life.” Moments after my connection with the Ocean an announcement came over the main intercom of the ship. It was for bingo at 9am! I told my sister that we should check it out. Ya know live it up by playing bingo, ha! We played and several numbers were called and when you are one number away from bingo you stand. People all over were standing up. People were calling false bingos left and right. Finally it was my turn to stand! That very next number was mine, but 4 others also stood up. Now if we all won the winnings would be split. One after another, again more false bingos. I begin to doubt my card. I was the last card to be read in that theater, and I was the only one to win $750 to spend on the ship for our day at sea. WHOA! I never win anything like that. I looked back on this event only a few weeks ago and realized, the Ocean gave that win to me, and live it up we did. My sister and I got full massage packages; we bought stuff in the shops for ourselves and some people at home. We shared our winnings on drinks for our dinner guests and spent the rest on ourselves with more beverages. I had never won that much money, I had never had such a nice watch, I had never had a massage. Who would have thought that this day at sea on our cruise would be the front lines to things I have never done. A year and a half later and lots of hard work and changes to my life I was about to step on to the moving vassal of my future that floats upon the Ocean, who has given me so much already…..Waiting, waiting, waiting to be assigned to a ship and finally it comes, for 6 months I will be on Royal Caribbean’s Jewel of the Seas touring, wouldn’t you know, the Southern Caribbean. I was so ready for this job. I was ready to have the Ocean by my side. Every time I could I stepped out on the open decks of my new job and had many talks with the Ocean. I poured my soul into these deep waters, as the beauty of the crashing waves mesmerized my senses. So began my love affair with the water not only did I hang out ocean side on the ship I also took every opportunity to float within the waters on every beach we visited. Then something terrible happened, I was allergic to something and it was bad. On the ship and on the shore they did all they could to remedy my situation to no avail. (in no way does my experience reflect what the guest experience on this amazingly beautiful ship.) I could hardly sleep, and my already long work days were getting harder and harder. It looked like I was going to have to be sent home. About a week before I did get sent home my watch that I bought on my vacation stopped working. Well my watched stopped before the time it should have but I now know it was a sign that it was time to go home. I pleaded with the Ocean as to why this was happening. I loved it out here in the open waters. I got home and it just did not feel the same. What I called home was more uncomfortable than ever. I knew shortly after that I must get near the Ocean once again. That is what brings me down here to Florida. This past week over Thanksgiving break I stood by the Ocean alone for just a few minutes at a time almost every day up in New Symerna Beach, FL. All I asked is “what is next”? This brings us up to just about right now! I Listened, I listened to the waves crash up on the beach, I felt the waves crash into me, I walked the beach up and down to let the Ocean know I was there. I woke up one of the mornings later in the week, and to my surprise my answers have come. The Ocean has spoken to me clearly once again, “Marc you belong here, the ocean needs you close by. Your job search landed a new career choice to make a different and it is where you belong right now. Your next step is to settle down and continue to build your new life here. Your next step is to find someone special to share the rest of your life with”. Everything happens for a reason, it is what you choose to hear and see that shapes your future. Live your life, Love your life, and share it with others. Take your next question to the ocean and let yourself accept whatever answer it gives you. Okay so that was long! But I hope that some of you have been inspired! I Sometimes part of becoming positive is reading positive stories or writing your own even. love all of you, and I am grateful for all your support. I wrote about this once before but this has to be my most favorite quote so far on my journey of change: “Anything worth doing was worth doing poorly-until I can learn to do it well.” – Zig Ziglar. I try so hard to keep my post short and sweet but sometimes I still amaze myself how much I could say and still have to say about Ultra Positivism. This blog is a living organism of my life and I share bits and pieces of it indirectly all the time in my posts about positivism. There is no GPS on my life, but you better be certain I will continue to leave a trail for those to follow and teach me new things. I started this blog out of heart break and just look at where I have come from that moment. I was not a writer, there was a day I was anything but positive, there was a day were life was not worth living. UP to today I built a never give up attitude, and I am surrounding it with Ultra Positivism from around the globe. I have all of you to be grateful for that. I may have uninspiring posts sometimes, my grammar may flounder in my rushed attempts to post, I may miss a week of posting here and there, I may fall to my knees in tears, but IT IS ALL WORTH IT. I may not know where I am going or where I may end up but I know for a fact it all adds to my tale of life and slowly I will pick up inspired and inspiring people along the way. I don’t know when I will become a motivational speaker or what I will even say but if just one day I can stand in front of hundreds or more, deliver life’s message and change the lives of each one I will have learned to do it well. I enjoy Famous Quote Friday but it is time for change. There is more out there, more then I have time to share. I don’t want to leave Fridays for just quotes. I will start to include video clips, music, pictures, other blogs, or Facebook pages that inspire me. I start today with a song. This song I have had for years and only in the last couple days did I search for the meaning of the title. I have also lost count of how many times I have listened to this song and how many times it continues to inspire me. A term from the Edo period in Japan refering to places, persons, or things of effortless perfection. Anything that is Shibumi is noble and fulfilling in a manner that is not shaped exclusively by analytical thought. Simply put, a state of great refinement underlying commonplace appearances. If I had to pick an important post this one is it. This is the one I want EVERYONE to share. For the sake of you, others and myself, help me find great things in life by helping me spread my message of Positivism everywhere. I cannot pay you I cannot force you but each and every one of you I owe a debt of gratitude for helping me share this blog and this journey with the world. I want to make a name for myself and with every post and every share I can come closer to my dream. PLEASE SHARE this post with those that you know. Those that see my blog for the first time share it with those you know as well. There are great things to come with https://upwithmarc.com/ and I look forward to inspire many and be inspired in return by each and every one of you. You can never achieve a great goal in life on your own and If there was a way I can help you I will. Links to follow me! It cost nothing but your time and a few clicks of the mouse! Share it, link it, copy and past it. Whatever you have to do. PLEASE help me spread the word. Other things to read about me! A little over 2 years ago I started this blog. I started it on fundamentals of positivism. I told you right away how important goals are in your life and I told you how important they are in mine. The thing more important than having goals is achieving them. Once you have done all you could, once you stand within your achievements it is always important to make new achievements. For every goal you achieve make a new one. Your life is not written in stone. People change, we change, and I change. We always want that change, but in a positive direction. I have achieved some of my goals and changed others in my life time, but in the last 2 years my determination for my goals has been greater than any years of my life. Formerly a Graphic Designer my goal was to sample what else is out there for me. This may sound like I am a crazy job hopper but so be it. I mentioned wanting to try Marketing, Event Planning, Social Media networking, and working on a cruise ship. Can you guess which one I did not do? Well believe it or not I have tried every single one! 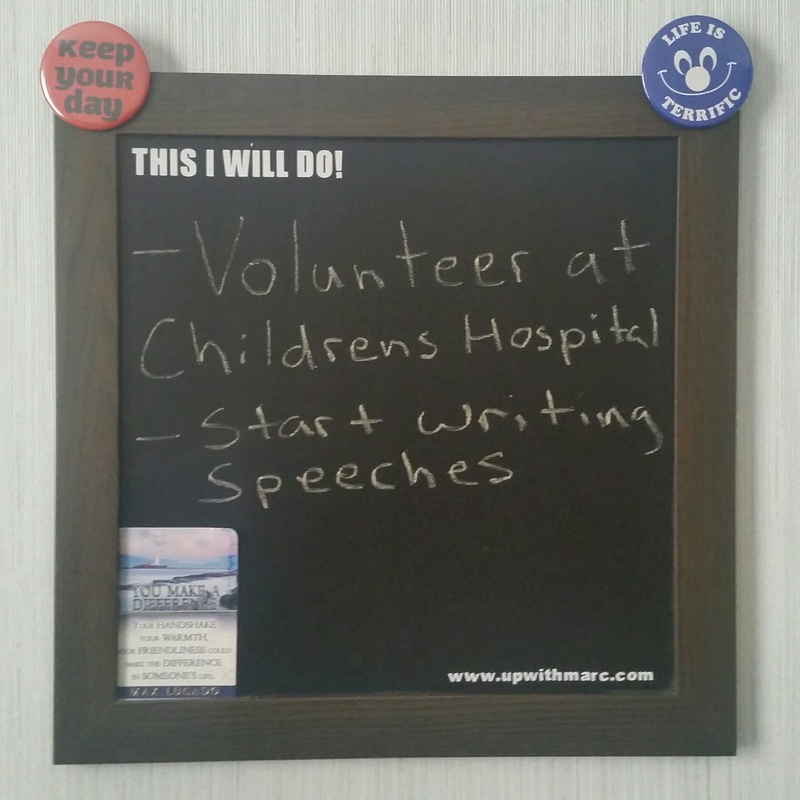 It was cool to look at my goals I wrote on my blog and realize how much I achieved in my career in just 2 years time. It was anything but easy and worth it every step of the way. I even went above and beyond my goal here. At one point I was painting grout in a new hospitals bathroom and I also started a new career as an ASD ESE Paraprofessional. It does not stop there I realize I was meant to explore more. This blog was not only meant to share positivism but to improve my writing. Certainly it is not novel quality work yet but all you grammatically charged followers can absolutely appreciate how far I have come with my writing skills and trying new things. I also wanted to grow this blogger bigger and bigger. I do not have nearly as many followers as I had hoped but gathering those followers is an art form in itself, an art form that will take priority at the right time. For now I am proud of my 200+ posts with over 6,000 views from 85 different countries! I owe allot of my success with followers to those that have found me and those that I have found to help me get stronger. A big goal I have kind of set aside was getting back in touch with my fine art side. I am ok with this because writing has been quite the art form and learning experience for me. I have lost the desire to own an art gallery but I have certainly gained something more exciting in its place. I can still bake a cake and decorate it like nobody’s business but this is also something I have stepped away from. I changed and my goals are evolving in that direction. It was a goal of mine to explore spirituality once again. In the past 2 years I have attended many services of different religions. I am happy to say that I may have found my place in the spiritual world, and for now I am going to role with it. I had said to myself that I wanted my blog to be a non religious form of positivism and I will stick to that. God, Angles, and whoever you respectfully worship is one avenue we can take for a more positive and prosperous life style. In my experience most people’s positivism is religious base, I want to find more avenues of positivism outside of that. Certainly you can connect many things of what I say to your faith but I want to give you something different. I will certainly have blog post in my future that are base off faith ideas, I am sure of it, and I respect and accept everyone’s differences and I am grateful to have found so many people that respect my differences. If you would like to take the time please go check out my updated GOALS page. Some of it is the same some is not. GOALS for the future of UPwithmarc. Make sure you Follow my blog and share this with your friends. I am very much a goal oriented person. I have life goals, large goals, small goals, and daily personal goals. I have goals to reach my goals. Goals are my life, and my motivation to get everything I can out of it. In the past I have overcome fears, I have achieved what I wanted in my education, and in my careers. With goals I have made myself a better person, and in turn I would like to think that I have shed some improvements on the lives of others as well. Life for me has been shifting. I am a full believer in things happening for a reason. I am growing each day into a new person. For those of you who know me already I am grateful you are part of my journey and for those new to my life I cannot wait to see what kind of connections can be made. For anyone that shares the same views as I do I hope that something special can be established. I was a graphic designer for over 10 years and I felt that it was time for a change. I got in to Marketing, I got into social media, I worked on a cruise ship, and now I have found myself working as an ESE ASD Paraprofessional. Quite a new and exciting job working with Elementary level students but new passions are still being discovered every day. A big goal of mine is to find my true passion. My main career goal is to be a Motivational Speaker. My main goal in my career has finally collided with finding my passion; to be a motivational speaker for children and taking on any path that will get me there. I have taken big steps to be where I am now but motivational speaking for children will be the biggest step for me and will require lots of little goals to achieve the ultimate goal. My main focus of my blog is to share with people ways of being positive in everyday life, and my creation of Ultra Positive mode (UP). I want to build myself as a Speaker. If you are following this blog you know that ball is already rolling for me. This blog is a big stepping stone in improving my writing and sharing my idea to all who are willing to listen. I do hope that not only will my blog inspire others but I hope it serves as an avenue for others to share their ideas with me. Along with my blog I will be sharing positive quotes, stories and pictures all over the social networking sites, Facebook, Twitter, Linked-In. I am flooding the world with positive everything and if I can show proven success in positive thinking and attract enough interest, I plan to start a Pod Cast and a You Tube channel(very excited for this). Socializing my ideas is only one part of making a name for myself and becoming a motivational speaker. There is work to be done in self improvement and education. I need to improve my reading and writing skills. I will most likely need to take speech classes and a number of other crucial classes to achieve what I want. In the mean time I am gathering my resources. I am reading up on how to be a good public speaker; I am listening to books on tape of great motivational speakers of our time. I have so much sinking in right now and it all feels awesome…I FEEL AWESOME. Several people have pointed out videos, books, CD’s and great authors to me. I encourage you to share any of your insights and resources with me. In closing I don’t know how clear this all is for those that do not know me but for those that do; I hope you can see this is a huge life change. I know already with my amazing group of friends and extremely supportive family, encouragement and support will not be hard to come by. Meeting new people will never be discouraged either. I have many goals in life they are not all listed here and they are always evolving. In the past 2-3 years I have accomplished so much with myself and this blog and I look forward to the time I need to update my goals once again! Thank you for reading. I am grateful for your following and I encourage you to share my blog with those that you call friends and family. I cannot spread the words of UP (Ultra Positivism) without your generous help. I love all of you.